In a Nutshell: Keesler Federal Credit Union is Mississippi’s largest credit union, with more than 200,000 members and $2.5 billion in assets. The institution’s branches cover the state and extend overseas to meet the needs of its diverse military membership. A suite of four credit cards offers members the choice between Visa and Mastercard, with student, low-rate, and rewards options available. Multi-tiered checking and savings accounts give members access to interest rates as high as 1.40%. Credit unions often pride themselves on being accessible to their members and giving back generously to the communities they serve. That task can be far more difficult when your members are scattered across the globe and need regular access to financial services. While most credit unions focus on one region, or maybe a state, Keesler Federal Credit Union must meet its members’ needs on a global scale. Keesler, already Mississippi’s largest credit union with more than 200,000 members and $2.5 billion in assets, also serves a large portion of the state’s armed forces community. Eight military bases reside in the state, and military personnel — including many Keesler Federal members — are stationed all over the globe as they serve their country. To help its overseas members, Keesler offers three branches in the UK on bases run by the Royal Air Force. The institution’s 26 branches throughout Mississippi and more than 100 fee-free ATM machines give accessibility to members anywhere in the state. The monthly drawings include valuable rewards for membership, like reimbursement of a credit card, signature loan, auto, or mortgage payment up to $1,000. One member each month who is enrolled in direct deposit will have his or her deposit matched up to $2,000. Keesler’s four credit card offerings give members the rare option of choosing between Mastercard- or Visa-issued cards. 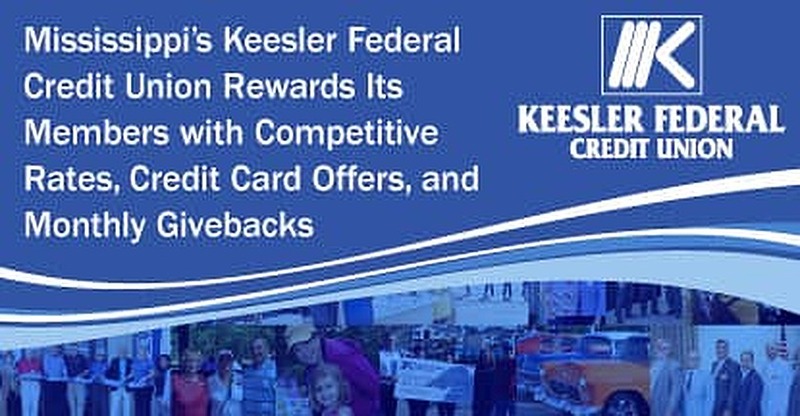 Keesler Federal offers four credit card options to its members. The Low-Rate Mastercard and Platinum Rewards Visa cards offer cardholders 0% interest on purchases for their first six months with the card. After that initial period, interest rates can be as low as 8.90%. Keesler also never charges balance transfer fees if members want to move a balance from a high-interest card to their Keesler Visa or Mastercard. All of Keesler Federal’s cards come enabled with an EMV chip, which increases card security by using a tokenized method of transmitting data. A scrambled transaction code that is never assigned twice is used during purchases, and personal cardholder information is never transmitted, which makes the cards nearly impossible to duplicate by thieves. Card applications are available online or through mobile devices for both domestic and overseas members. More than 55,000 cards are currently in circulation with a full suite of online tools, including balance-check and bill-pay features, available to cardholders. 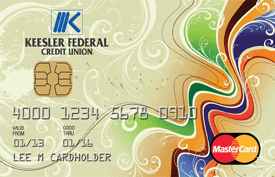 This Mastercard offering is Keesler’s most popular card in part because it gives members interest rates as low as 8.90% after a six-month interest-free period. Rates can climb as high as 15.9% depending on creditworthiness. Credit limits range between $500 and $25,000, with no annual or set-up fee. Cardholders can choose from five different card designs to add a little individuality to their wallet. Keesler Federal’s rewards option lets cardholders earn points for every purchase. The points can be redeemed for rewards like travel, electronics, jewelry, and other name-brand merchandise. The card has no annual or set-up fee and interest rates range between 9.90% and 16.9% — which is very good for a rewards card. Credit limits vary depending on an applicant’s credit history, but start at $500 and top out at $25,000. The First Flight offering, issued through Mastercard, is a solid choice for credit-building consumers. The card’s interest rate ranges between 10.9% and 15.9% with credit limits of up to $1,500. 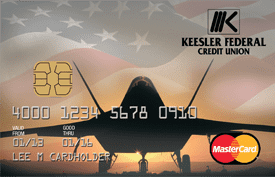 “The card used to be for active military members only, but it’s evolved over time and we’re now offering it to recent college graduates who are building their credit,” said Michelle Augustine, Card Services Manager at Keesler Federal. The Student Mastercard is available to students with a parent or legal guardian as a cosigner. The card’s interest rate ranges between 8.9% and 15.9%, based on creditworthiness, and charges no annual or set-up fee. Credit limits on the card fall between $500 and $5,000. Members also have access to checking, savings, and loan products designed to meet their diverse needs. An eAdvantage checking account offers an impressive 1.40% APY on balances under $25,000 if account holders meet the monthly criteria of 15 debit card transactions posted to their account and one bill paid with Keesler Federal’s Online Bill Pay. Members must also sign up for eStatements and direct deposit. The account has no minimum balance. An $8 monthly maintenance fee can be waived if account holders meet certain credit union criteria. The institution also offers savings accounts and loan products. The popular “KreditLine” has unsecured variable interest rates around 4.75% with a minimum credit line of $500 and affordable monthly payments set at $15 per $500 of the current balance. Signature Loans are also available with interest rates as low as 7.99% for up to 60 months with optional credit life and disability payment protection. 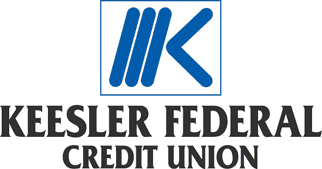 Keesler Federal Credit Union has become Mississippi’s largest credit union by offering competitive interest rates on savings, checking, and loan products, as well as credit card options that match the needs of its more than 200,000 members. KCFU offers credit cards issued by Mastercard and Visa. Keesler Federal offers Mastercard interest rates that start at 8.90% with no annual fees. Visa Platinum Rewards’ cardholders accrue points for their everyday purchases that can be redeemed for vacations or brand-name merchandise like computers and jewelry. The company is dedicated to serving its members and offers multiple locations around Mississippi, Louisiana, and in the UK for active military members with accounts. That accessibility is part of Keesler Federal’s mission to constantly give back to its members.